...(and that would be me) got some pretty cool stuff at a yard sale Saturday morning (and for next to nuthing, which is the great thing about yard sales!)... Rhoda at Southern Hospitality is also sharing her great chandelier find and has a list of lots of other yard-saling bloggers sharing their recent finds, so be sure to stop over there when you're done here! ...and look who was right there to check everything out the minute it came into the house! Okay, how cute is this little 'stainless steel' tea kettle timer? 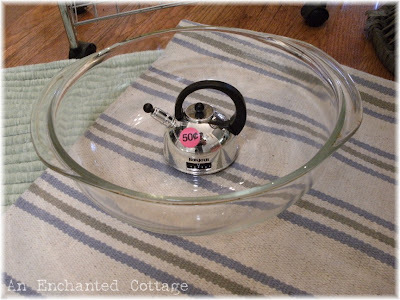 And this 3 quart glass Pyrex casserole/serving dish is going to get lots of use! So in the end, Spotty approved of all my purchases and told me he's anxious to lay (shed) on the scatter rugs as soon as they come out of the wash! I'll show you where I ended up using everything in a post later this week!! You did great today! I love the wicker planter in particular. 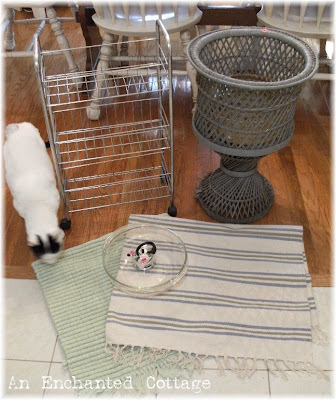 Love the rugs too, but my cat would do a bit worse than "shed" on them, so I am rug-free! Awww kitty. I like the wicker planter in the gray also, but I just like that kind of dove gray lol. Great finds! Good girl....very nice finds! It's the only way to shop. What fun finds! (You know me...I'd spray paint the wicker a cottage white.) All in all, a spectacular day for thrifty finds! I feel so left out this week. With hubs working and my car dying... no sales this week. Maybe next weekend. Love the planter!! You did get some really great items. Boy, I sure could use that little wire shelving unit in my laundry room!! Isn’t it funny how our cats always check out all of our new stuff?? One of my cats would have been in the wicker planter at that point. Great finds. I love the tea kettle timer, too cute! Before I ever scrolled down to your second picture I knew I would see a cat in it. Just like my two who need to smell everything that comes through the door! Donna - you did indeed get some great deals! Everything is great but I most love Spotty checking everything out. After all, you have to pass inspection before you can keep them! The cats in my house must inspect everything that comes in the door also. Must be the boss in them. (Or should I say bossiness?) You did great with your finds. I'm going to have to get out there and hunt too! I like the color of the wicker plant stand also. It would look beautiful with a geranium in it. You had fun didn't you, I love to find bargains like that. Great finds! I got some good ones too this week. Must have been a good week! 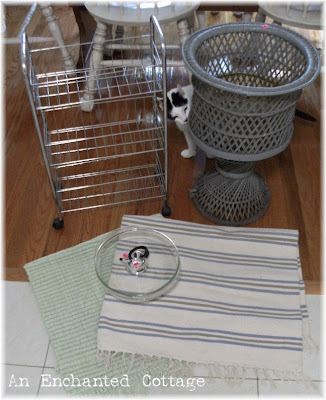 Love that wicker planter, and the kitty! I love seeing what everyone has found in their treasure hunting. And it is a bonus when we are told what the plans are for such items. Thanks for sharing yours. Very nice finds. I like the wicker planter too. And all of your stuff is so useful. Glad you joined the party! 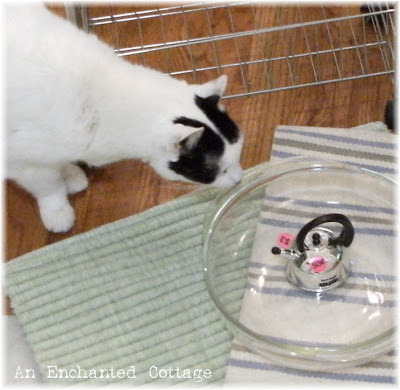 I just love that little stainless steel tea kettle timer, again wonderful finds. Hope you have a nice week. You found some really great deals. 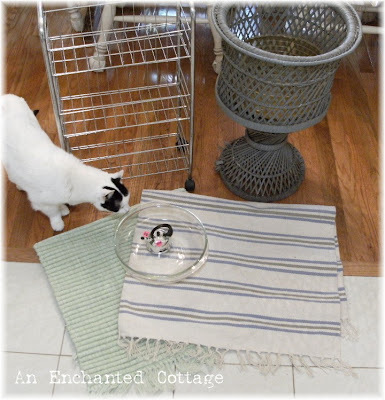 Love the scatter rugs & the tea kettle timer is too cute. You got some real goodies. I love how your baby has to come check it all out, mine do the same, sniff around for a while before they decide it can stay.